Stanley Clarke (electric bass guitar, vocals, handbells, acoustic piano, piccolo bass guitar, humming, acoustic bass, gong, chimes), George Duke (keyboards), Ray Gomez (electric & rhythm guitar), Icarus Johnson (acoustic & electric guitar), John McLaughlin (acoustic guitar), David Sancious (keyboards, Minimoog, organ, electric guitar), Tom Malone, Dave Taylor (trombone), Jon Faddis, Alan Rubin, Lew Soloff (trumpet), Milt Holland (percussion, triangle), Earl Chapin, John Clark, Peter Gordon, Wilmer Wise (horns), Al Aarons, Stewart Blumberg, George Bohanon, Buddy Childers, Robert Findley, Gary Grant, Lew McCreary, Jack Nimitz, William Peterson, Dalton Smith (brass), Marilyn Baker, Thomas Buffum, David Campbell, Rollice Dale, Robert Dubow, Janice Gower, Karen Jones, Dennis Karmazyn, Gordon Marron, Lya Stern, Ron Strauss, Marcia Van Dyke & John Wittenberg (strings), Gerry Brown (drums, handbells), Billy Cobham (drums, Moog 1500), Steve Gadd (drums). After a very successful run with Chick Corea's Return To Forever, world class bassist and multi-instrumentalist Stanley Clarke branched out on his own and made some very credible solo albums. When School Days hit in late 1976, it was not uncommon to hear tracks like Hot Fun and School Days being played on all formats of radio. Whether it be urban, rock, or jazz, the School Days album was the go to album of choice for many radio stations, as its rhythms and cosmic funk / rock / jazz energy would truly enhance the listening experience to a whole new realm. Friday Music is so very honored to offer for the first time on 180 Gram Audiophile Vinyl the legendary Stanley Clarke School Days album. Mastered impeccably from the original Epic Records tapes by Joe Reagoso at RTI/AcousTech, this stunning album is a fusion masterpiece just perfect for the audiophile vinyl domain. For this star studded affair, Stanley Clarke reached out to some of the greatest musicians of all time like John McLauglin, George Duke, Billy Cobham, Chick Corea, Steve Gadd, Icarus Johnson, and many others. Not only do you get the wonderful songs previously mentioned, but there are even more classics like Quiet Afternoon with some very solid drumming by Steve Gadd, Desert Song featuring a stunning duet with John McLauglin on guitar, as well as the apocalyptic album closer Life Is Just A Game, which features some very powerful bass and drum fireworks between Stanley Clarke and Billy Cobham, with George Duke's amazing keyboard expertise. To celebrate this special limited edition release, we have also included a very rare gatefold cover, which features all of the original artwork elements, which haven't been seen in years. 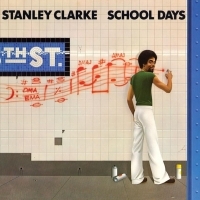 School Days... by Stanley Clarke... on stunning 180 Gram Audiophile Vinyl... from your friends at Friday Music. FUSE ON !